WinSent Messenger is an instant messaging client developed for chat sessions between members of the same local network. The application provides an alternative to the text-based program Net Send. 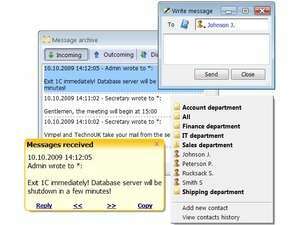 It supports text-based messaging and also includes adding a LAN user address book. The program is pretty basic but provides exactly what it advertises. Winsent Messenger 3.2.8 is a shareware program and can be used as a demo to try the software until the free trial period has ended. A full version of the program is available after the trial period ends. For security reasons, you should also check out the Winsent Messenger download at LO4D.com which includes virus and malware tests. Additional screenshots of this application download may be available, too.